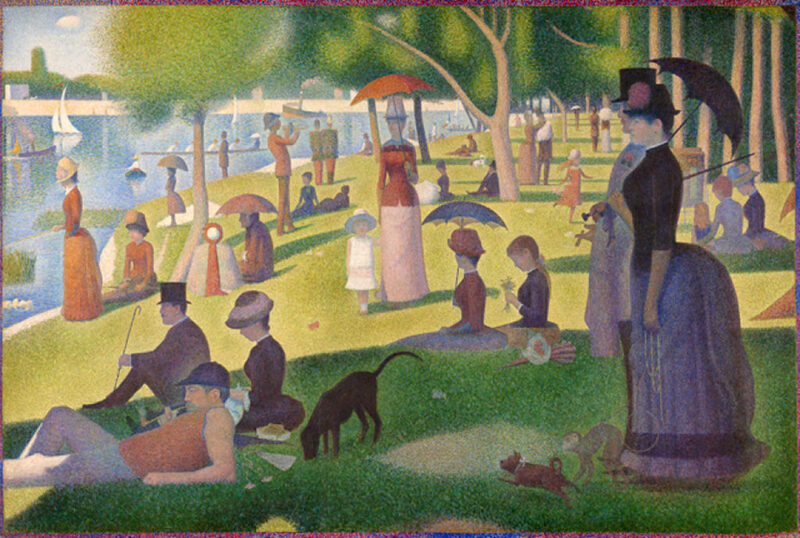 Mason chose to recreate George Surat’s pointillism masterpiece, A Sunday Afternoon on the Isle of La Grande Jatte, or as many English speaker’s refer to it, Sunday in the Park. This painting contains 54 human figures, (six of them holding parasols) eight watercraft, three dogs, a cat and a monkey. It includes the river Seine and the rolling hills of the bank. Well of course, why recreate a painting with just a boy & his dog when you can do something more, much more. 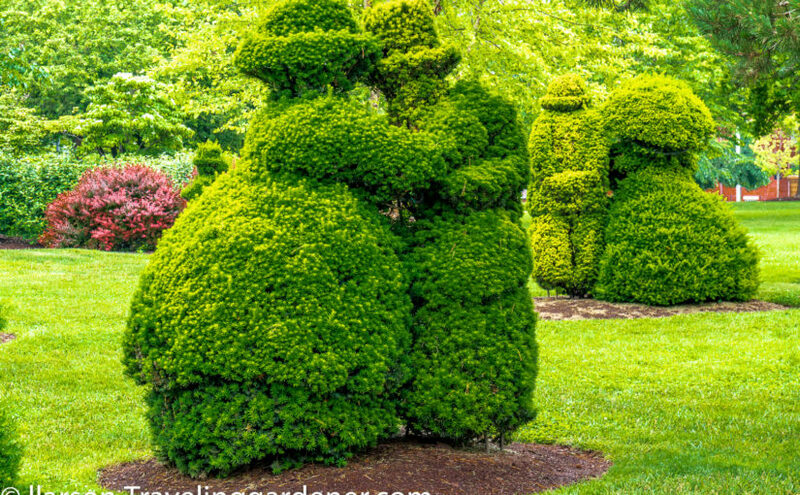 In 1988 Mason’s wife asked him to create a topiary in their home garden. Mason who trained as an engineer but had artist energy in his soul came up with his plan to recreate Surat’s painting. Who does this? Mason and his wife both worked for the Columbus Parks and Recreation department so she pitched the idea to the city. They loved the idea! The city put up money matching generous donations that poured in from the community. The city provided the land, a 7 acre parcel in the downtown that fallen into disrepair. 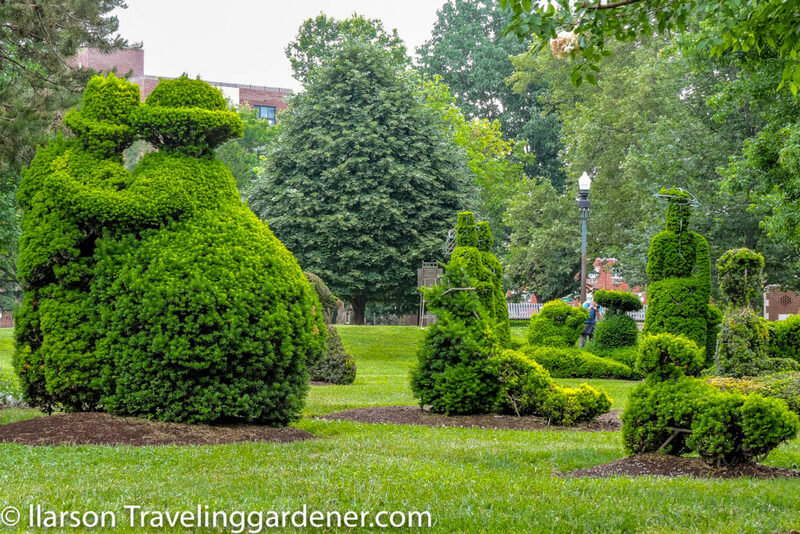 Mason created all the topiary frames. 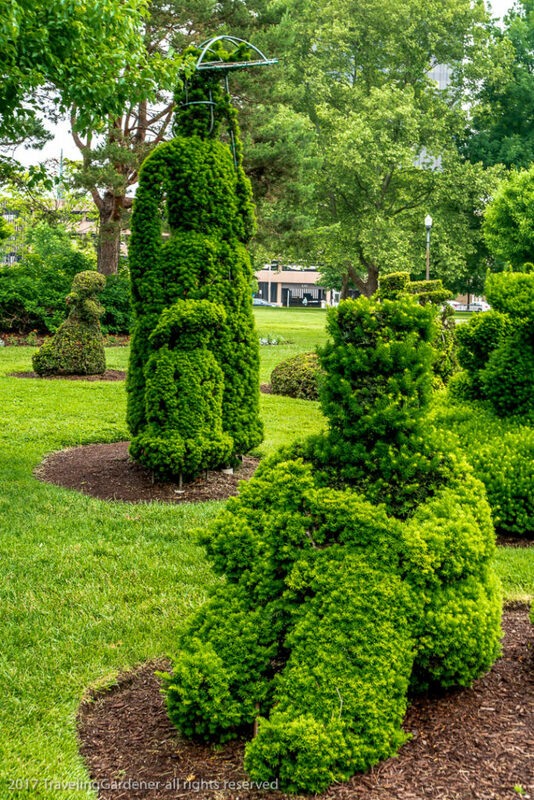 His wife instructed the park gardeners on the care and art of trimming. 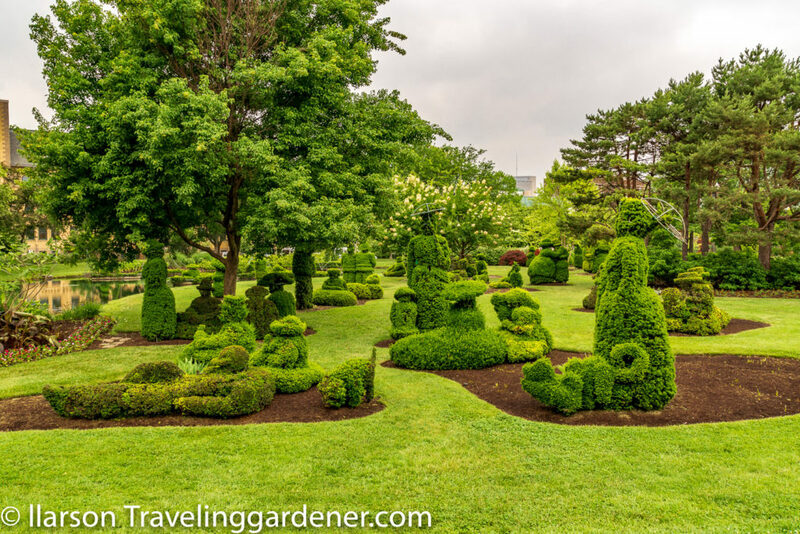 A pond was created to mimic the Seine river of Paris, the flat ground sculpted to imitate the river bank. In 1992 the park was opened. A brass plaque with the relief of the paining is positioned at the point of view to observe the entire scene. It is amazing. The sheer size of the project is impressive. 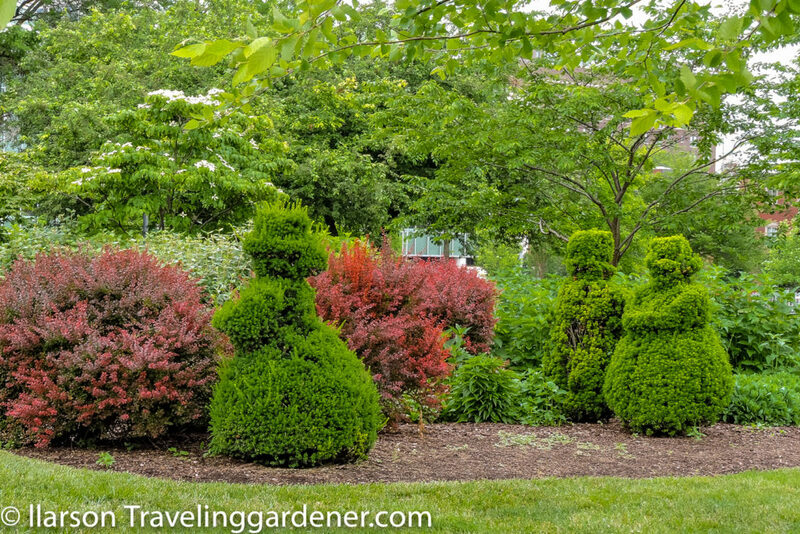 The plants are yew, the tough, prickly and remarkably shapeable are used for the figures. The tallest figure is 12’ high. Nearly 30 years since the idea was formed the entire scene stands proudly and clearly identifiable. There are the relaxing figures lying on the lawn. The uniformed officers look on the scene, there are strolling couples, a woman walking her monkey on a leash. The water craft includes a sailboat, a scull complete with rowing crew and a motorized craft with a fisherman. As you walk through the landscape you realize the size and scope of the figures and I eagerly went back to the painting to look more thoroughly at the characters on the canvas. The original painting is in the Chicago Museum of Art. The canvas measures 7’ x 10’ and took Surat two years to paint using the pointillism technique which is individual points of color. Estimates are there are over 1,000,000 individual dots of paint. It took genius, imagination, determination and invite patience to create this work of art. The painting was panned by the critics when it was first exhibited. Two years later Surat restretched the canvas and added a border of more colors. The painting was in storage for nearly 30 years before it was purchased by private collectors and loaned to the Chicago Museum. 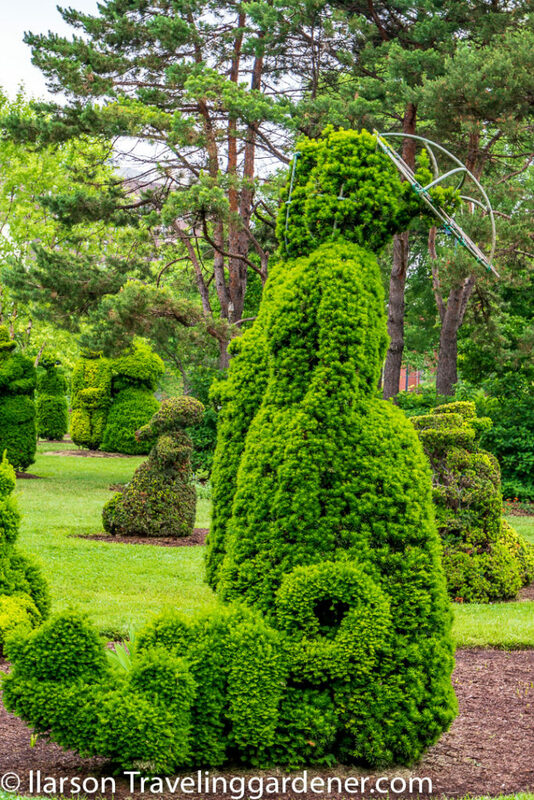 James T Mason’s genius was to let his artistic soul create a topiary masterpiece. 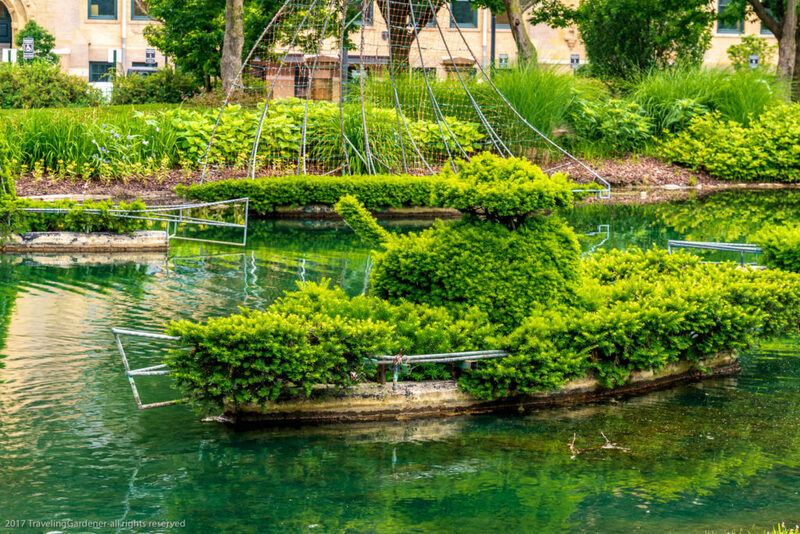 He had the imagination to envision a project requiring great determination and patience to let nature create his living canvas. When the garden opened the community warmly embraced the project and continues to support it today. Yet it is the very type of art-scape that causes more than a few visitors to wander through shaking their head at the scene. I loved it on every level. Creativity requires courage. Art requires an audience to engage, willing to look deeply into the work of the artist where you may find delight, surprise, and inspiration to create your own masterpiece. 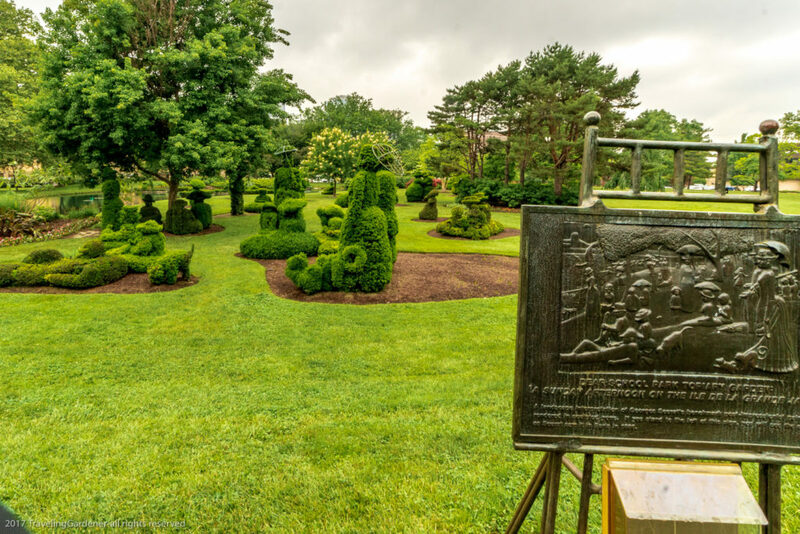 The city of Columbus generously offers a public space with a mammoth artistic effort for its citizens and visitors who simply wander in, for a look. Woman walking her monkey on a leash, dog leaping alongside. James T Mason continues his artistic efforts. “I majored in engineering because everyone said, ‘Don’t be an artist,’” he says. (https://www.hammondharkins.com/artists-2/james-mason/) But once he got started he received a degree in fine arts, and taught at the Cultural Arts Center of Columbus. He did sculpture, wood carving and now pursues watercolor. and remains passionate about the beauty of the human form. At 81, he says. “I want to drop dead at the easel, That’s the way to go if you’re an artist.” I think most gardeners would have a similar sentiment. 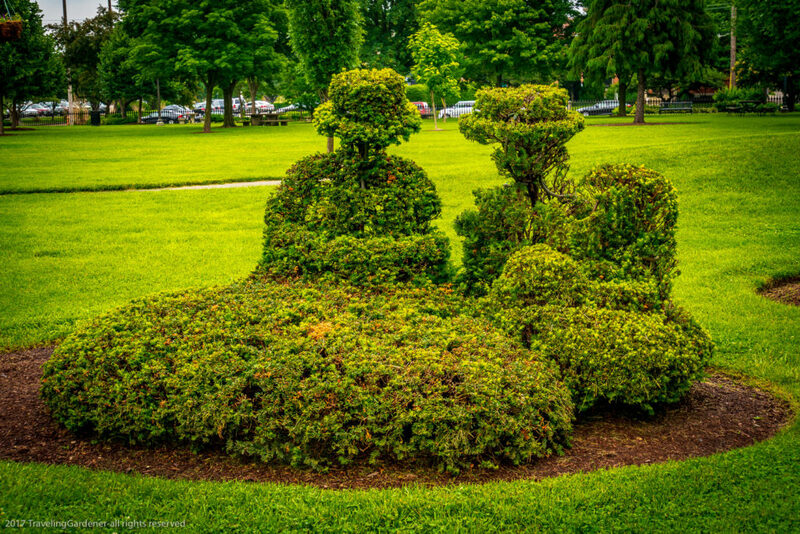 http://www.cityscenecolumbus.com/arts-and-entertainment/galleries/topiary-park-sculptor-to-explore-painting/ He is represented by Hammond Harkins Galleries in the Short North, OH. 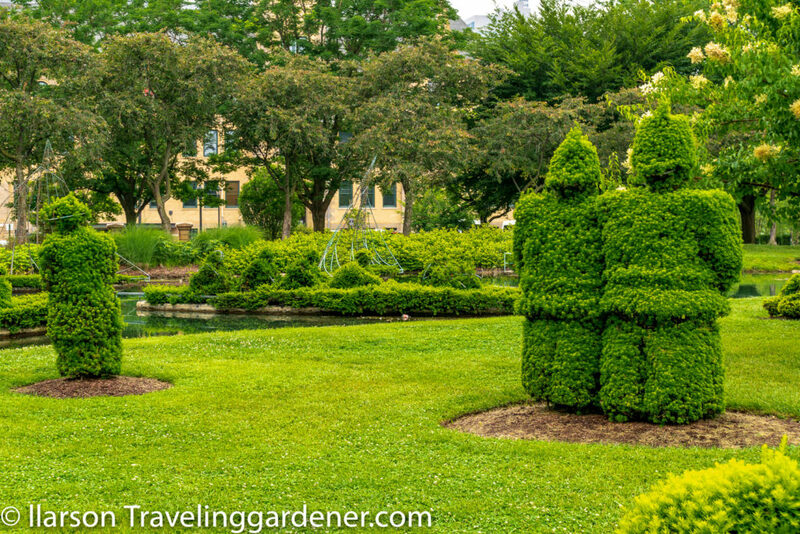 What fun it was to see these beautiful Columbus gardens. 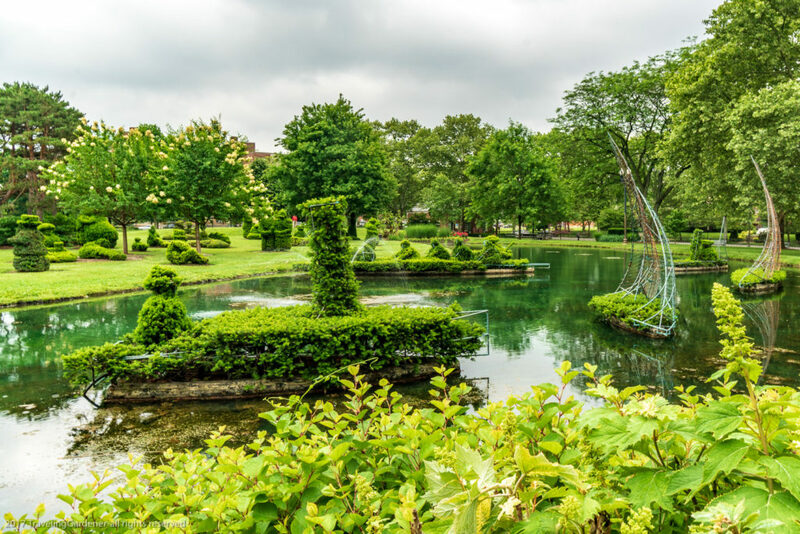 If you were traveling by car, we wonder if you might also have visited Mansfield, Ohio’s Kingwood Center. It is beautiful most times of the year. We were traveling by car but didn’t go to Mansfield! Everything in Ohio was growing like crazy!